Recently had a pair of rack mounted Oberheim SEMs to look at (SEM = Synthesiser Expander Module) which came to me a bit unwell. Main fault was that the filter on one of them had turned itself into a volume control. Anyway powered up faulty module to check if anything else was wrong and was struck by how rich the oscillators were. Dammit this synth sounds really good EVEN WHEN IT IS BROKEN! As I had already studied the circuit diagram and had ordered some spare parts based on a description of the fault from the client it took less than an hour to fix. This was aided by the very neat design that puts pots and switches on one PCB and the electronics on a second PCB that plugs into the first via a number of multiway connectors. A couple of minutes with an oscilloscope confirmed that the fault was as expected, powered down and replaced prime suspect number one (a 3080 OTA in the filter) and bingo, up and running. What a filter. On paper it should be weedy, only 12dB / octave but coupled with the previously described oscillators it sounded awesome. Reminded me a bit of the power of a set of Moog Taurus pedals. Neat part of the SEM is the pot that allows you to go from Low pass to High pass filter vis Band pass. There is also a switch on the same pot that allows you to select Notch filter as well. So the sad bit is that I passed on a beautiful example of an Oberheim 2 voice at a reasonable price which puts two SEMs and a splendid little Minisequencer all into a very neat package along with a 3 octave keyboard. First surprise: First speech synthesiser was developed in the 1770s by Wolfgang von Kempelen in Vienna! Von Kempelen’s machine was the first that allowed to produce not only some speech sounds, but also whole words and short sentences. The machine consisted of a bellows that simulated the lungs and a ‘wind box’ that was provided with levers to be actuated with the fingers of the right hand. The levers actuated a ‘mouth’, made of rubber, there was also a ‘nose with two nostrils that had to be covered with two fingers unless a nasal sound was to be produced. The whole speech production mechanism was enclosed in a box with holes for the hands. Second surprise: Wheatstone, developer of the Wheatstone Bridge (electrical engineers will know all about this) also experimented with speech synthesis. Third surprise: The Voder was an instrument that you played. Homer Dudley at Bell Labs had been refining the idea that vocal sounds can be grouped into a fairly small number of pitched and un-pitched sounds that could be created electronically. For example letter “A” is pitched and the letter “S” is un-pitched. He also realised that the vocal chords were a “carrier” and that the lips, tongue, cheeks etc. were filtering the carrier to create all the different sounds required to produce speech. He reasoned that if these simulated sounds were then strung together in the correct order then speech could be created from scratch. His system used ten filters that could, if used in the correct combinations, create approximations of the most common vocal sounds. The (highly skilled) operator of the Voder had to manipulate 10 keys, a footpedal and wrist switches to create each of the sounds. Apparently it took about a year to become good enough to produce reasonable speech. The Voder was one of the attractions at the World Fair in New York in 1939, along with a robot that would smoke cigarettes! So as you can see the Voder was effectively a vocoder that you manually ‘played’. Homer Dudley went on to develop the Vocoder which automates the analysis process by splitting the the input speech into the same bands as the keys on the Voder thus automating the process. The principles of the Voder do live on in some modern equipment / systems. Adding a computer to the system it is possible to make text to speech converters that construct speech from text in real time. As a computer is doing the manipulation the intelligibility is much better and it is the system used by a number of up market Sat Nav systems to read out street names. I’ve bought a digital synth that I think is brilliant! I have been re-aquainting myself with my old Nord Modular (G1) so when I was offered a Nord Modular (G2) recently I decided that it was time to upgrade as the newer version had some important improvements that were worth having. As a test of what could be done I considered how you could re-create something like a Novachord. The Novachord was the first polyphonic synth dating from the late 1930s with something like 160 odd valves in it with very crude controls but due to the way the oscillators work (one for each note in the top octave, then loads of divider circuits) everything sounds rather warm. The problem then was to recreate the subtle tuning discrepancies and other general vagueness as well as duplicating the restricted controls of the original. Thinking the Nord wouldn’t be able to do this, I started patching away. First bit was easy, 12 voices, variable shape oscillator to create the core waveshape which was mainly sawtooth but a bit bent. 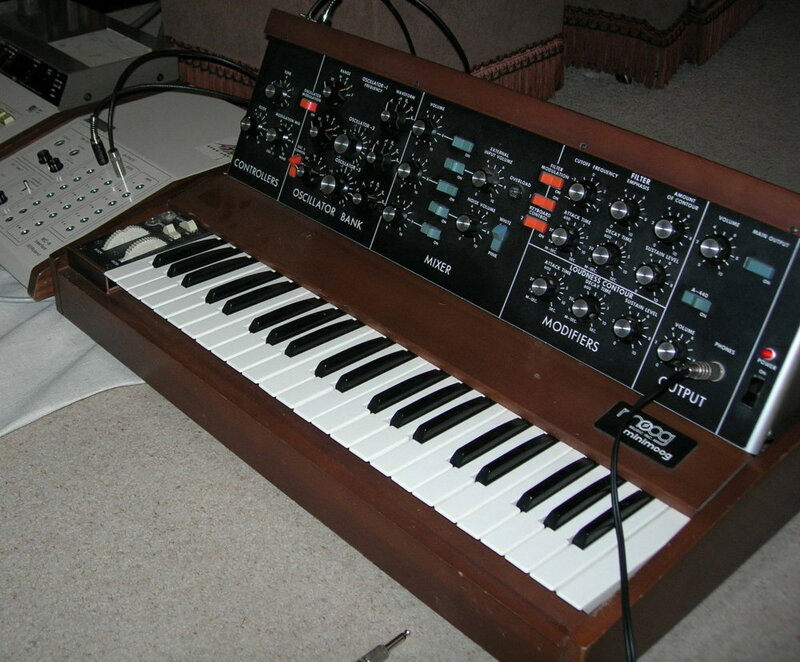 The variable shape oscillator managed that, with an additional narrow pulse an octave above synched to the first oscillator to simulate the switching glitch caused by the dividers. So far so good. 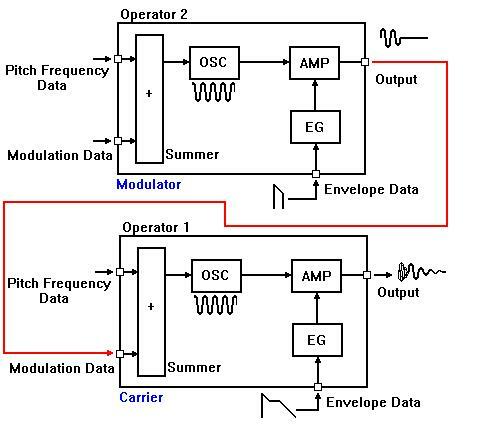 Next the scanner vibrato – a bit more of a challenge, basically the original is a number of very short delays derived from a chain of capacitors, a mechanical switching system then determines how many delays are applied and the delayed signal is then summed with the original. Bit like a chorus pedal. The filters of the Novachord were simple to replicate as they were all fixed. The filters were put in the FX area so only one instance of each for the entire instrument. The controls of the original were replicated by switching control values using fixed constant value modules to give the reduced resolution. The entire patch - voices at the top, filters at the bottom. Final problem was the vague tuning. That was achieved by combining the voice number output with a control sequencer to apply a small tuning offset to each voice. A similar arrangement was constructed to slightly offset the scanner speed as there was more than one scanner line in the original. 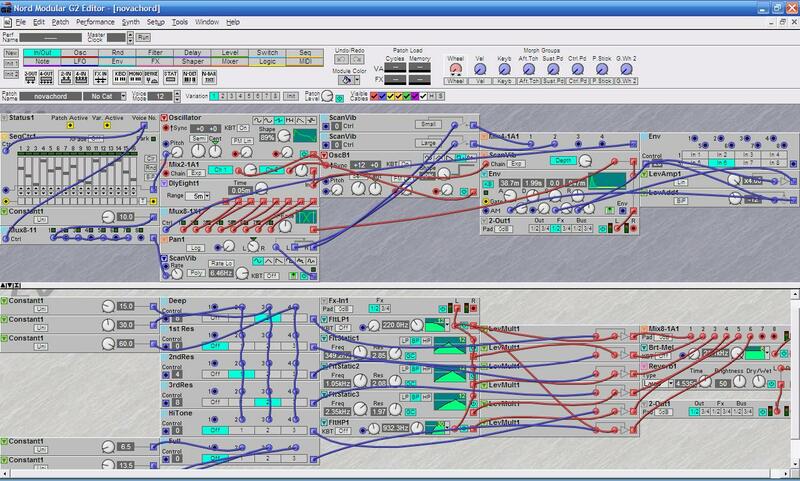 Some time ago I described how the humble ARP sequencer could be used as an improvisational tool. Well recently I’ve been rediscovering my Nord Modular which is an odd mixture of real and virtual. 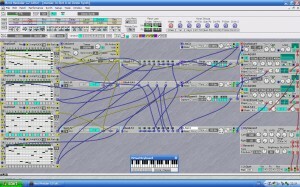 The synth is real enough and consists of a DSP based synth that is programmed from an editor running on a PC. The clever bit is that the synth works even when the PC editor is disconnected. I originally got the Nord Modular to replace my ARP 2600 that I had owned for 16 years as I thought it would be more versatile and take up less space. It is, especially good is the way you can create modules as required, so if a patch needs four sequencers you just keep dragging extra sequencers onto the edit window until you have enough or you run out of DSP capacity. Anyway I recently was reading about the Klee Sequencer that is based on a shift register and the ability to sum certain outputs from shift register as it runs. 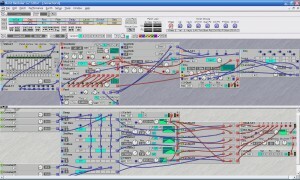 The summed outputs are then used to control the notes played by some VCOs, just like a normal sequencer. Having read up on the sequencer and just before I fired up the soldering iron (my weapon of choice) I thought “I wonder if I can construct a virtual sequencer from some of the virtual logic modules”. The answer is, yes.